"The orthosis gave me a sense of security, because I couldn't make any wrong movements". 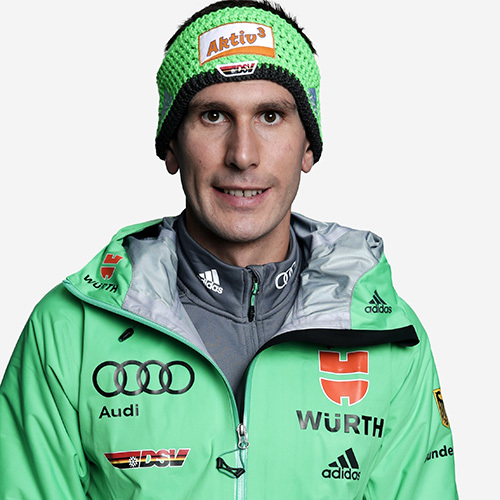 Interview with Andreas Katz, professional athlete and member of the German Ski Association about his shoulder injury, his therapy and the course of treatment. Mr Katz, you tore two tendons in your left shoulder in a fall while mountain biking at the end of July. How were you first treated? "At first I didn't think the fall had been too bad, because it wasn't that painful. So I only went to the doctor's the next day. They treated my open wounds and it seemed as if I'd only suffered contusions and bruising from the fall. But the German championships and the central performance checks by the German Ski Association were held in September. At that time, I was examined again by a shoulder specialist at the Marienstift Orthopaedic Hospital in Arnstadt, because the shoulder I had injured was somewhat higher and my maximum strength had waned a little. After the MRI, it was clear that the supraspinatus tendon* and the long biceps tendon had torn". Your injury wasn't operated on until 20 September. Were there any complications? "No, everything went perfectly. The German Ski Association arranged an appointment for the operation straight away. During the arthroscopic operation, the long biceps tendon was cut and fixed outside the shoulder joint with two titanium anchors. The supraspinatus tendon was sewn back onto the head of the humerus using absorbable anchor sutures. The swelling after the operation was only minimal". After the operation, you wore the medi Arm fix shoulder orthosis. How did you get on with the product? "At first it was a real challenge for me, because the shoulder and the arm were completely immobilised for three weeks. Thus, I had to rely on help, for example, when washing and dressing, because I could only move my right hand, I couldn't lift or turn my left arm. The orthosis gave me a sense of security, because I couldn't make any wrong movements". It was very comfortable to wear and very easy to put on, so my parents, brothers and sisters or friends were able to take over straight away". After how many weeks did you switch to the Omomed shoulder support? How happy are you with the product? "The support was the right choice for me, because it immobilised the arm and gave me stability and a sense of security, but still allowed me to do a certain amount of sport while wearing it. I put the support on myself – it's quick and easy. The healing process is now so far advanced that I only need it when making quicker movements while training". You also use medi's shoulder therapy set. Would you recommend it to others? "Yes, because it's been a great help up to now. I hung the hoist up in my room during rehabilitation and pulled on it every evening to mobilise the shoulder. Now I use the fitness strap to strengthen the shoulder. It's the perfect training tool, because I can use it everywhere. I had it with me at this year's Tour de Ski, when I was on the road working with the TV company. It's practical and very effective". 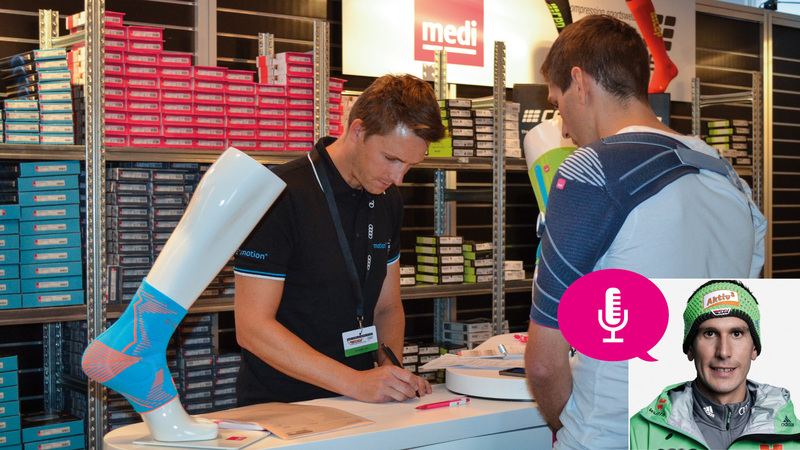 medi has been a sponsor of the German national skiing teams for many years now. How important is this co-operation, especially in times when professional athletes like you sustain an injury? "This sort of co-operation is very important. I find it fantastic that we have in medi such a competent partner in this field; the company is also there for you at a moment's notice and supplies the necessary products". How do you find the co-operation with medi? "Very good and above all uncomplicated. For example, after the operation, I rang medi directly and asked about possible supports for my shoulder. The Omomed support is the right product for my injury. And that's what they gave me". What other products from medi do you wear and why? "I wear the medi travel socks, if I'm flying or whenever I'm facing a long journey. This way, I can prevent thrombosis and have light legs when I arrive. I also wear compression sportsocks from CEP, for example, when jogging, because they make me feel good. I'll soon be testing the ski socks made of microclimate-regulating Merino wool". What other rehabilitation measures are planned for you? "That depends on the outcome of the next MRI scan, but I'm optimistic that I'll soon be able to start training again, because everything's gone very well so far". How do you motivate yourself to return to your previous performance level? "I'm always highly motivated, because cross-country skiing is my passion, my sport. This is why I’m doing everything possible to start skiing again and I give my very best every day. I also met several soccer players, handball and hockey players during my rehabilitation. Every day, we showed each other the progress had made, which gave everyone the necessary push towards new successes". Which skiing competitions are you planning to enter? "It's difficult to say how long I will still need until I can ski again. Whether I can make it to the World Championships in Finland is going to be a very close call, but I'll do everything I can. Perhaps I'll manage the impossible. My major objective is to take part in the 2018 Olympic Winter Games. I really want to be there and that's what I'm working towards". Mr Katz, many thanks for the interview. * The supraspinatus tendon is one of the rotator cuff muscles. It is important for lifting the arm forwards and to the side. Andreas Katz joined the SV Baiersbronn Skiing Club at the tender age of 5. He celebrated his first successes in the Nordic combined before switching to cross-country skiing. His greatest dream is to take part in the Olympic Games. However, the professional athlete and member of the German Ski Association has been resting since his shoulder injury in July 2016. In the interview, the 29-year-old reports on his first major injury, the medical care he received and on the healing process.